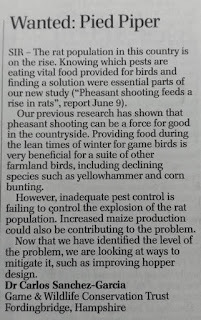 There has been an uncontrolled growth of the rat population in this country, and knowing what pests are eating vital food provided for birds and finding a solution was an essential part of our new study (Pheasant shooting feeds a rise in rats, report 9th June). 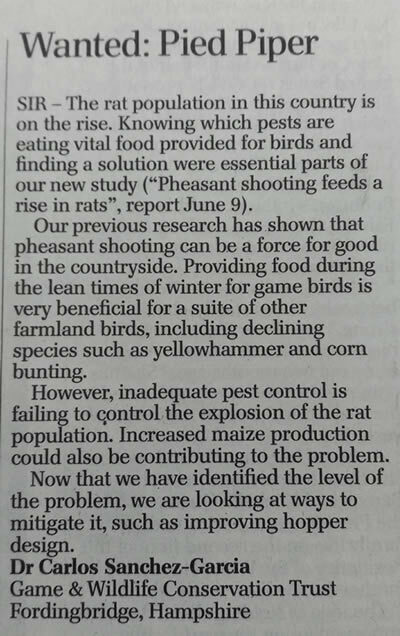 Our previous research has shown that pheasant shooting can be a force for good in the countryside and providing over-winter supplementary food during the lean times of winter for gamebirds is very beneficial for a whole suite of other farmland birds including declining species such as yellowhammer and corn bunting. However, we need to investigate why the rat population is exploding in this country and treat the cause. Inadequate pest control to keep their presence at low levels all year round especially around farm buildings is not helping to control their growth, while increasing maize production could also be contributing to their rise. Our study on hopper feeding wanted to investigate what pests are stealing food and to explore ways that will make this life-saving activity more effective. Now we have identified the level of the problem, particularly where pests are not being controlled, we are looking at ways to mitigate how we can overcome this dilemma, such as improving hopper design. Although our study did not address habitat loss such as hedges, it is misleading to say that farmers are ripping them out as the Hedgerow Regulation Act now provides legal protection of this important wildlife habitat.